At the corner of West Third Street and West Street in the good town of North Manchester lies this vacant lot been vacant for many years. Why sould such a valuable corner lot remain unused? If you were superstitious or had a wandering mind had this been an old burying ground scene of a tragedy? Let's go back into the history of this section of the town of North Manchester. In the early 1900s this was the west end home of the laboring factory workers where they had big families and tough kids. unemployment pay back then. You ran up grocery bills in bad times and paid them off in good. It was the west end way of life. In the 1920s when I was growing up in that end of town, North Manchester was divided into three parts. The west end was separated from the rest of the town by two railroads; the Big Four and the Vandalia. To those of us who lived in the west end, anything east of the railroads was foreign country. The merchants, the factory owners, doctors, lawyers, learned people had their homes around the hub of the downtown business district. Oh yes, our teachers in the old West Ward Grade School also sought sanctuary in that section of town. Then there was the third section of town, the whole northeast section the College end. You only had to see those kids up there hey, their dads were all high-class college professors. Every school day they went to school with their shoes on, white shirts, yes, some even wore neckties, and their hair always seemed to be combed. Such was our idea of the town as we grew up in the 1920s. But what did the kids in the northeast section think of us? Sad to say we never knew, as they never came to our west end to swim in the old gravel pit, fish in the river below the dam or hike and play in Amos Miller's pasture and woods. Well, what the heck did learned college kids think of the west end of North Manchester. Manchester College was a fine school of learning backed by the Church of the Brethren. They believed in no nonsense college education with emphasis on the humanities. Manchester College, headed by Professor Otho Winger was justly proud of the young graduates who moved out into the heathen world as Christian missionaries; China, darkest Africa, anywhere in the world there were souls to be saved. We will never know what discussions and meeting were held, but the college and the Church of the Brethren came to the same conclusion. There was no church west of the railroads in North Manchester a place where there was a real need. They would take some of the overseas mission money and build a church in west Manchester beyond the tracks. It would be operated and run by college students who were studying to be missionaries. I have always felt the real reason went something like this if the students could survive making converts in this part of town they could make good in any part of our heathen world. They built a two-story stucco-coated church on the corner of West Third and West Street in the heart of west Manchester and they named it the Mission Chapel It was operated by college students with the guiding hand of the college and the Brethren Church. There was only one paid employee, Bill Gill, who lived across the street. Bill was paid one dollar a Sunday when the weather was cold enough that he needed to fire up the one-lung furnace in the basement of the church. I was four years old, as was my chum Raymond Gill. We both lived next door to the church and through our pleading our mothers let us go unescorted to a special Sunday evening service that had been talked up that morning in Sunday School. I an sure Raymond and I expected something very exciting as we climbed those steps up into the auditorium. A lady usher met us and looked around for our guardians. Seeing we were unescorted, she put us in a trap right next to the register in the middle of that room. Raymond and I watched as the paper went sailing up to the ceiling. We looked at each other and like one, we tore both programs into tiny bits and pieces and filled my cupped hands to the brim with confetti. I held them out over the register and let them go as our speaker was building up steam. The bits of paper went up like Old Faithful spouting to the ceiling. A gasp went up from the audience. The speaker froze in the middle of a sentence, as paper snow fell all over the audience. Very soon that same lady usher was standing at the end of our pew, beckoning for us boys to come to her; We were escorted to the church door and told to go home to our mothers. Today the church is gone. The went end now extends a mile further to the west and North Manchester is one nice town to live in. I am still proud to have been a west end brat. Reprinted from THE PAPER by permission of Jack Miller. 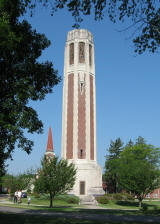 The Volunteer Mission Band was an organization of students focused on creating and directing the religious life of the school. Members were those who expected to spend their life in Christian service in the US or abroad. It was a large organization and one of the activities the group sponsored was Sunday School work in the west end of North Manchester. On May 17, 1916 the minutes show that a committee of the Mission Band was authorized to rent a house for the use of the Sunday School. 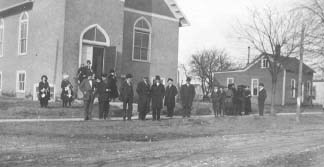 On March 4, 1917, a committee was appointed to confer with the Manchester and the West Manchester churches soncerning the purchase or erection of a permanent building for the Mission. Permission was granted by both churches to solicit funds and A. D. Helser was given charge. Largely through his untiring personal effort and contagious zeal the necessary amount was secured. Some of the money was secured from North Manchester and community and the remainder from outlying churches that made donations to this fund. and preaching services, as well as Manual Training and Sewing rooms for the children was dedicated. Sunday School was held every Sunday afternoon, followed by a short sermon by some minister of the town . On Saturday, sewing and manual training classeswere conducted for the children of the district. This work was done through the Volunteer Band, and offered splendid opportunity for practical mission work. The people in the district of the Chapel responded in a beautiful way to the service rendered them. The Chapel was the property of the College, but the work there was in the hands of the Mission Band.